Sterling, Va. — After graduating Jalen Williams, Jordan Miller and Dominic Peterson in 2018, a lot of critics didn’t expect the Loudoun Valley boys basketball team to be as dominant as they were in past years. Well, over halfway through the season, they’re in a familiar spot: atop the Dulles District, after a 73-61 win over the Dominion Titans on January 11. That Dominion team came into the year with a new coach and low expectations, but a stretch where they went 6-1 propelled them to the top spot in the Dulles District until the match up against the Vikings. There are some players who get to the line at a high rate. Houston Rockets shooting guard James Harden is known for his ability to draw fouls almost at will. While Loudoun Valley junior guard Trent Dawson isn’t an NBA MVP candidate, he has the same ability Harden does to get to the line. In a three-game span at the Bobcat Classic, Dawson shot 23-of-31 from the line. Then in a win over Woodgrove on January 4, he went 17 of 20 from the line. Most recently against Dominion, Dawson shot 15 free throws, making 12 of them. Dominion junior forward Adam Thomas – who drew the assignment on Dawson – fouled out in the fourth quarter due to the play of the Loudoun Valley point guard. There was one play, where Dawson took a three-pointer and as he landed, got knocked down by Dominion junior guard Sam Shelton and finished the four-point play. The moment probably broke the Titans: a killer swing. That isn’t in any way to take away from what Dawson did, because he was like a conductor in a orchestra, except the conductor grabbed a trumpet and joined the symphony for a solo for part of the performance (I don’t know classical music and it shows). The Vikings play a fast-paced style, running up and down the court. They’ll take the ball out after made baskets and try to catch opposing defenses before they’re set… and guess who’s the one initiating the fast breaks? If you guessed Trent Dawson, you’d be right. The kid does so much scoring and setting up his teammates. Dominion got caught sleeping a few times and gave up a ton of easy points that way. Dawson runs the show, and he does it exceptionally. Loudoun Valley junior guard Avery Nance is one of those players who’s fun to watch on defense. He’s supremely athletic, with great feet and long arms that allow him to be effective on defense and his hands are any coach’s dream. Multiple times in the game, he poked the ball away from a Dominion guard on the perimeter, his hands darting in and out like a cobra, poised to strike at any time. It led him to numerous steals and easy breakaway layups. He’s also got this fire that is absolutely great to see. He plays with a lot of passion, and when he’s locked in, he’s special defensively. He locked down the Dominion guards in a way that I hadn’t seen anyone do throughout the year. There’s no easy way to put it: Dominion struggled mightily to initiate offense with their guards. Their three main ball-handlers – Sam Shelton, Jayden Hickey and Max Mancuso – were extremely bothered by the trapping defense of the Vikings. Shelton – who had played exceptionally throughout the year – seemed to feel the effects of game-planning. The Vikings had a concerted effort to control him, with Nance telling me after the game that they knew Shelton was the main ball-handler and that their focus defensively was on him. It showed. Loudoun Valley head coach Chad Dawson threw extra defenders at Shelton at any opportunity, and it bothered the young guard. This was the first time he’d had a team specifically key in on him, and he had a tough time adjusting. That’ll come with time, it’s an aspect of Shelton’s game that’ll come with experience dealing with extra attention. You’ll see incremental improvements in it throughout this year and a huge jump in reading and reacting to defenses like this in his senior year. This game was absolutely huge. 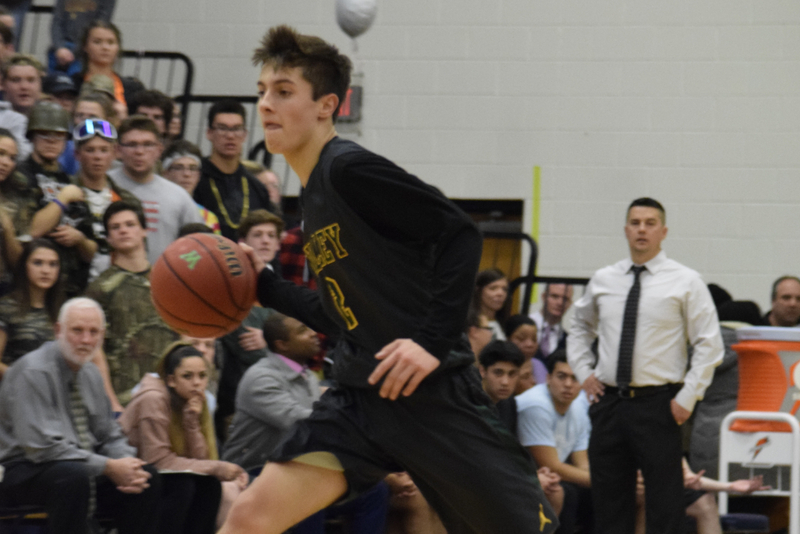 With their win and a Riverside loss, the Loudoun Valley Vikings are now the team everyone is chasing in the Dulles District. Dominion drops to second, and due to the snow, doesn’t have to face Riverside until January 30. Instead, the Vikings will take on the Rams on January 18, in a match up that once again, will probably be for supremacy in the district. On January 17, the Titans travel to Heritage, a team that they’ve beaten once already, on a Shelton buzzer beater, in an effort to return to their winning ways and start another hot streak before the Dulles District tournament begins. Great article Varun! I have a clip of Dawson’s ‘Harden-esque’ 3-pointer in the Dominion game; tweet @statstream and I’ll get it to you. PS, it was nice to meet you after that game! I was streaming it from the bleachers.